Butch Morris conducting his Conduction® No. 189, S & P at PONCHO Hall Saturday night. 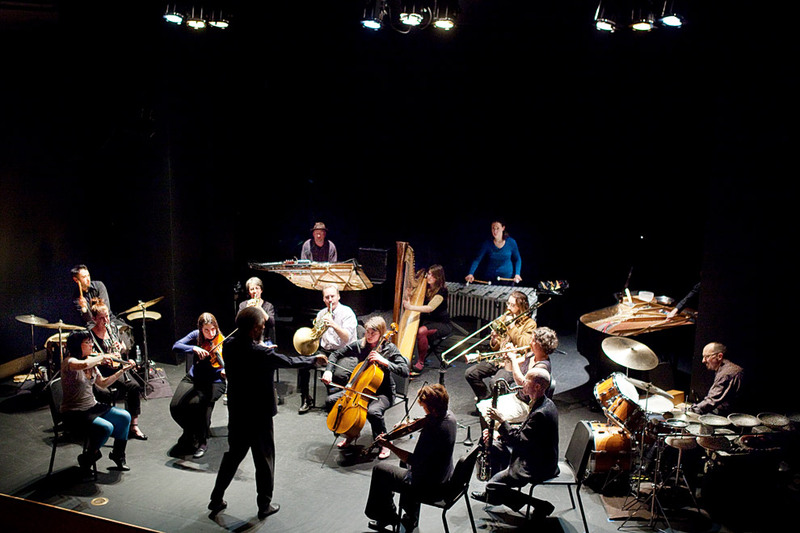 The New York-based composer, conductor, and cornetist Lawrence D. “Butch” Morris redefined the roles of composer, conductor, and performer with this concert which featured two separate 15-member ensembles. Below is Butch working with the Associate Artists Ensemble. The second group was the Master Artists Ensemble of: Brianna Atwell, viola; Heather Bentley, violin; Samantha Boshnack, trumpet; Greg Cambell, percussion; Lesli Dalaba, trumpet; Beth Fleenor, clarinet; Craig Flory, woodwinds; Wayne Horvitz, electronics; Paris Hurley, violin; Paul Kukichu, percussion; Joanne de Mars, cello; Lisa Miller, piano; Steve Moore, keyboards; Katie Rife, vibes; Monica Schley, harp; Tom Varner, horn. This was one of the most interesting performances I have seen in a log time. 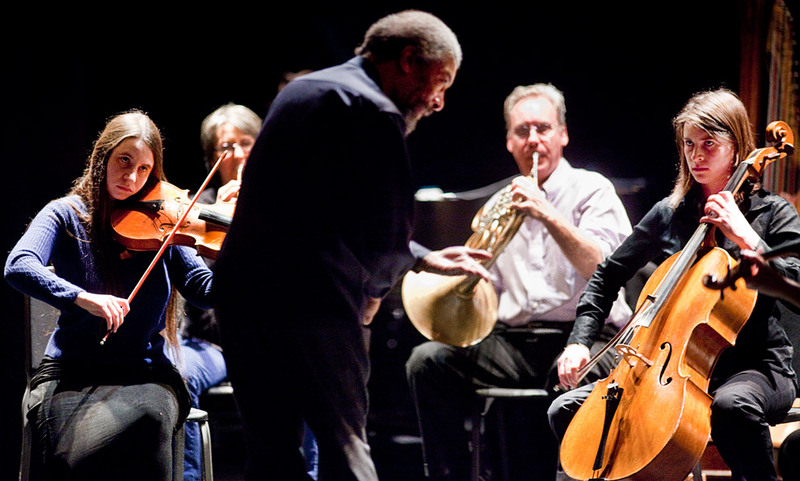 Lawrence D. “Butch” Morris is recognized internationally as a leading innovator in the confluence of jazz, new music, improvisation and contemporary classical music and the principal theorist and practitioner in the evolution of Conduction®. Since 1974, his career has been distinguished by unique and outstanding international contributions to film, theater, dance, television, radio, interdisciplinary collaborations, concerts and recordings. Employing more than 5,000 musicians in 23 countries and 63 cities, Morris has opened the door to a new understanding of musical language. 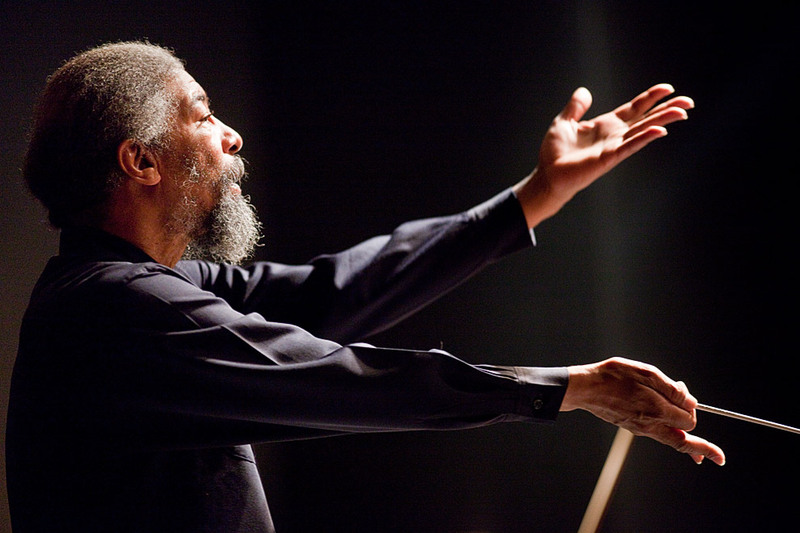 Morris has acted as a resident conductor and lecturer at institutions such as Princeton University, California Institute of the Arts, Yale University, Wesleyan University, New York University, University of Westminster, London, Orchestra della Toscana, Florence, Mito Museum, Mito, Japan, the Whitney Museum of American Art, and many others.